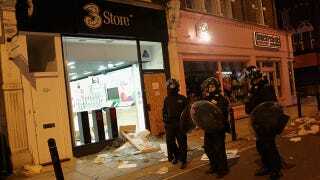 While the majority of the damage caused by rioters and looters was contained to London, the madness spread to Liverpool, Birmingham and other English cities, with electronics chains being the worst hit. As it stands, most of the thugs were actually teenagers and children as young as 11, all with a taste for sportswear and electronics, which saw chains such as JB Sports and Curry's looted and torched in what the BBC described as "no go zones." What started in Tottenham, North London, on Saturday spread to Brixton in South London, and further afield, to Croydon, Balham and Peckham amongst other suburbs. A video shot in Brixton (minutes away from where I live, incidentally) showed damage caused to shops on Sunday night, with an eyewitness reporting that cellphone stockists were targeted most likely because they're "small valuable items that you can disappear with quickly." It wasn't just the electronics stores which were targeted by these criminals, though—a Sony distribution warehouse in North London was ransacked and set on fire, before it collapsed during Monday evening. The clean-up effort started in the early hours of Tuesday morning, with local councils and residents pitching in to return their areas to some semblance of normality. If any Londoners reading this would like to help, the Twitter account @RiotCleanup is your best bet, with the matching website occasionally falling down due to a high influx of traffic.